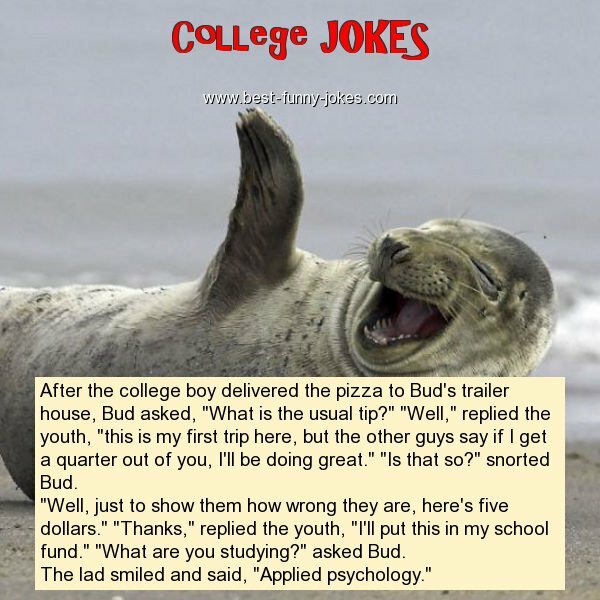 After the college boy delivered the pizza to Bud's trailer house, Bud asked, "What is the usual tip?" "Well," replied the youth, "this is my first trip here, but the other guys say if I get a quarter out of you, I'll be doing great." "Is that so?" snorted Bud. "Well, just to show them how wrong they are, here's five dollars." "Thanks," replied the youth, "I'll put this in my school fund." "What are you studying?" asked Bud. The lad smiled and said, "Applied psychology."